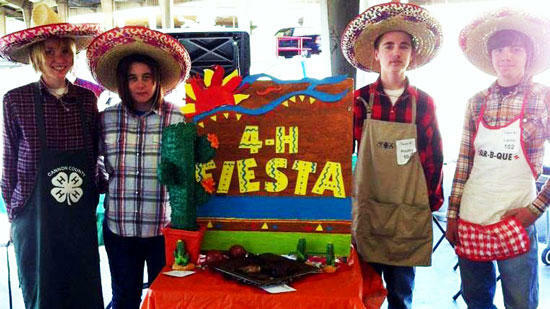 The 2011 Cannon County 4-H Senior High Outdoor Meat Cookery team recently competed in the State 4-H Outdoor Meat Cookery contest held at Knoxville. Pictured above (L to R) are Caytrain Swoape, Bre’Anna O’Neal, Dylan Sweeney, and Jeff Nokes. At the contest, each member was required to cook and submit at least two pieces of Beef, Lamb, Poultry, and Pork. For the 2011 contest, Caytrain entered her sweet maple syrup pork, Jeff entered his rosemary garlic lamb chops, Dylan entered chicken legs basted and flavored with the traditional Tennessee 4-H Chicken BBQ sauce, and Bre’Anna entered an aged filet of beef flavored with salt and ground pepper. In order to compete at the state level, the team placed 1st in the Central Region Contest held in August at the Wilson County Fair. Congratulations to all the participants and special thanks to our sponsor JWS Specialty Meats of Erin Tennessee.